"The story you are about to see is true. Only the names have been changed to protect the innocent." 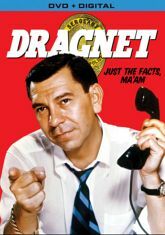 Dragnet was famous for its use of actual Los Angeles Police Department case files. Jack Webb portrays Sgt. Joe Friday, who works the dayshift with his partners on a variety of interesting cases. This program was reincarnated in 1967; eight years after its first television series had ended, with Jack Webb reprising his role of Sgt. Joe Friday.